Welcome to Chinatown located in Lower Manhattan. There are locations around the United States touting the Chinatown name, but Manhattan's Chinatown is the largest outside of Asia. Chinese immigrants arrived in New York in the 1850's during mounting violence in China. They were hired to build the Central Pacific Railroad by the hundreds. Americans in the textile and tobacco industries loved the Chinese Immigrants because they would work for lower pay scale and longer hours then the average American. Of coarse that made the common man outraged against the Chinese for taking their jobs. Although the Chinese were hopeful to earn money and return to China, this did not happen for most. They were driven to larger cities, where they would blend in better. The south east side of New York City was considered a blighted area in the 1850's. Many Chinese lived among other races and cultures there. Today, Chinatown, consists of two square miles of shops, homes, restaurants, and more. Restaurants representing the cuisine of just about every province of mainland China and Hong Kong, plus Indonesian, Malaysian, Thai and Vietnamese eateries and shops. The Chinese community has many events and celebrations at some of the hottest clubs in the Manhattan area. 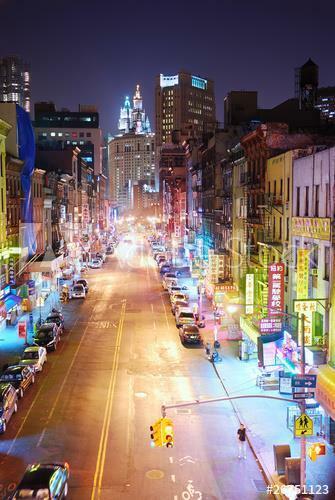 Bordering the Lower East Side to its east, Little Italy to its north, Civic Center to its south, and Tribeca to its west, Manhattan's Chinatown is one of nine Chinatown neighborhoods in New York City. Chinese immigrants make up the second largest foreign born congregation in the city, with the 2010 census showing a huge influx. The population is estimated at around 95,000 citizens in 2013. The Cantonese dialect that has dominated Chinatown for decades, is being quickly replaced by Mandarin. Apartments along the edges of Chinatown can range from $1.8 million for 880 square feet on Centre Street to a cool $14 million on Canal Street with over 11,000 square feet of living space.